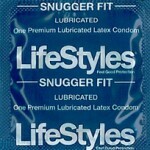 Lifestyles Snugger Fit Latex Condoms 40 Pieces individually wrapped display bowl. Lifestyles Snugger Fit Condom is designed to deliver the added stimulation and natural feeling you crave. Tighter fit. Ultra sensitive with a unique, natural feeling shape. Lubricated for extra glide and enhanced sensation. Natural color and low latex scent. 40 condoms per bowl .